The winner of three consecutive races on ovals of various sizes, Bell spent a rainy Friday analyzing his impending first start around The Glen’s 2.45-mile/11-turn “short-course” layout. Victory at the Finger Lakes facility that formerly played host to the FIA’s Formula One World Championship would allow Bell to tie Sam Ard’s NXS record of four consecutive wins set in 1983. Ard reeled off his victories at South Boston, Martinsville, Rougemont and Charlotte Motor Speedway. Scheduled for 82-laps/200.9 miles, Saturday’s race is the first of three on natural-terrain road-courses for the eries this month. Visits to 2.258-mile Mid-Ohio Sports Car Course in Lexington, Ohio, on Aug. 11 and 4-mile Road America layout in Elkhart Lake, Wis., on Aug. 25 are sandwiched around the tour’s annual nighttime extravaganza around Bristol Motor Speedway’s high-banked/half-mile bull-ring on Aug. 17. 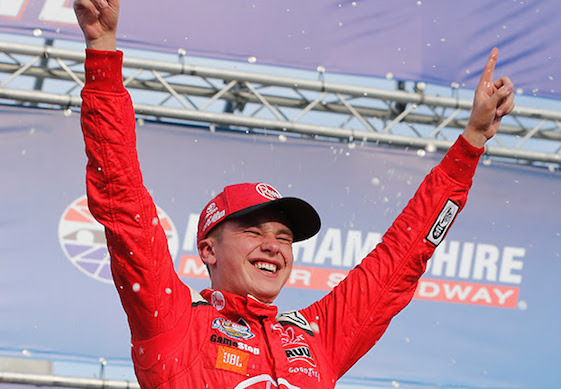 Bell’s 2018 resume includes a victory at the 0.75-mile Richmond International Raceway in April. Bell’s three-race streak includes Victory Lane visits at the 1.5-mile Kentucky Speedway on July 14, the 1.058-mile New Hampshire Motor Speedway on July 21 and the 0.875-mile Iowa Speedway last Saturday. Bell qualified third in Newton, Iowa, and led 94 of 257 laps to become the first NXS regular since Dale Earnhardt Jr. in 1999 to win three consecutive events. That win capped a scorcher-of-a-month that saw Bell notch three wins, four top-five finishes and lead 204 of a possible 762 laps. “For me, the only stat that matters are wins, race wins,” said Bell, the two-time/reigning champion of the Chili Bowl Nationals for Midget cars contested indoors in January at Tulsa, Okla. “That’s the only thing that I care about and for the most part I feel like that’s the only thing the teams care about _ if you’re a winner or if you’re a loser. Unfortunately in this sport, second place is losing. Just that win column, man, that’s the only thing that matters to me. As noted, Bell leads veteran Sadler of JR Motorsports by 16 points and is 18 points ahead of Stewart-Haas Racing’s Cole Custer in third. Through 19 starts, Bell has posted a series-best four wins, a series-best 12 top-fives and four stage wins _tied with Sadler and Justin Allgaier for series-most. Bell also has accumulated 24 Playoff points, 16 more than nearest competitor Allgaier with eight Playoff points. Bell tops the Rookie of the Year standings by 134 points over Tyler Reddick heading into an event that will be televised by NBC beginning with pre-race coverage at 2 p.m. (EDT). The race also will be aired on SiriusXM NASCAR Radio 90 and MRN Radio. Qualifying is scheduled for 11:35 a.m. Saturday. Rain played havoc with the Xfinity schedule on Friday, putting a quick halt to an opening practice that saw only six drivers record laps. Wayne Auton, Xfinity Series managing director, earlier informed the field’s rookies during their meeting they were required to record at least one lap Friday, no matter the track conditions. Bell obliged with the fourth-fastest circuit among that group at 82.232 mph on a sheet topped by Reddick at 89.513 mph in the No. 9 Nationwide Children’s Chevrolet. “It’s exciting. Watkins Glen is a really fast road-course,” said Bell, a 23-year-old native of Norman, Okla., who cut his racing teeth on the dirt tracks of the Dallas-Fort Worth Metroplex. “I’ve tried to do all of my homework and prepare myself as much as I can. Road-course racing is something I’ve enjoyed in the past. Especially at Canada (Canadian Tire Motorsport Park). Last year, at Road America in the Xfinity cars, I struggled (started fourth and finished 19th). That definitely has my confidence down coming into here. I don’t know what to expect as far as results for tomorrow. “Definitely, the lack of experience is huge. But for me in my past, shifting has been extremely difficult going into road-course races. I don’t know if I’ve had a road-course weekend where I haven’t blown a motor yet by missing a downshift or missing an upshift and accidentally downshifting. So that’s the No. 1 goal is to get through the weekend without blowing a motor. Back-to-back championships in the Truck and Xfinity series clearly would embellish Bell’s status as NASCAR’s next can’t-miss Monster Energy Cup Series driver. But with which OEM? Therein lies the conundrum. Curiously, Bell said he has not enjoyed much one-on-one face-time with Gibbs during his tenure with the former Super Bowl-winning head coach. “I haven’t talked to him outside of on the phone in Victory Lane or at the racetrack right before I get in the race car on the grid,” Bell said.”I haven’t dealt with Coach much at all in my time in his organization. So as far as going into Cup, obviously there’s no hole (team opening) right now, so that’s the biggest problem. And then the second-biggest problem is money; where does the money come from and who wants to…where does the money come from? However, Bell made it clear he has “every intention” of remaining with JGR and Toyota. ”I mentioned before that I feel like they’re the best organization in NASCAR,” Bell said. “They’ve put a lot into me and Toyota was the one that really…they’re the reason why I’m here. I would love to stay with them, and hopefully it works out in the future. “Going into next season, I’m set for another year of Xfinity. But as far as what I ‘need’ _ honestly, I don’t feel like I need another year of Xfinity. I think the best way for me to win at the Cup level is to get there and start trying at it. “You know, I feel like I’m different than the guys that have been coming up here over the last couple years. Everyone is saying that they’re moving guys up too quick, and the difference is that I’m 23-years- old _ I’m not 18, 19 or even 20-years-old. I’ve got a lot of racing experience and right now I feel like I’m in my prime as a race car driver. If the opportunity comes to go Cup racing next year, I definitely don’t want to waste another year in my prime, so to speak, of not learning and not getting that experience of Cup racing.